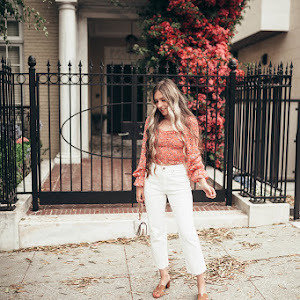 I'm currently obsessed with romantic tops paired with boyfriend jeans. This beautiful lace top is by Stone Cold Fox 'Holy Tube'. Its so tough to find boyfriend jeans that fit me since I'm petite. I finally found the perfect pair by Joe's 'Distressed Relaxed' Denim. They weren't made to be boyfriend jeans so the fit was smaller, so they turned out to be the perfect boyfriend jeans for me. And of course an outfit without heels isn't complete, here I'm wearing my every day sandals by Saint Laurent 'Jane' . I have a major crush on different eras in time especially the 70s. When I saw these sunglasses by Oliver Peoples 'Alisha' I felt warped back in time to that era. Cat eye sunglasses will always be my go to!